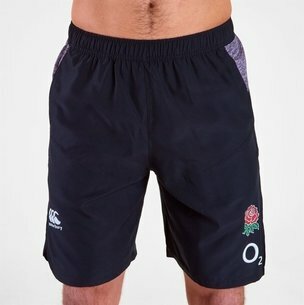 Cheer on England and help Carry Them Home this 6 Nations and Rugby World Cup when you train in these England 2019/20 Players Fleece Rugby Training Shorts from Canterbury. These shorts come in a soft hand feel fabric with a waistband. The drawcord is rubber tipped and the pockets are mesh lined. These shorts are black with grey down the sides. The England rose and CCC logo embroidered on the left and right as worn, respectively. The team's partner, O2 - a collaboration since 1995, is embroidered underneath the rose.